The ‘perfect melt pool’ – wax has melted from edge to edge, 1 cm deep. The first time your light your candle you must burn it for 3 -4 hours to set the “memory burn”. If you’ve ever experience “tunneling” of a candle before, it was probably because you blew the candle out too soon and the wax had not been able to fully melt across the entire surface of the container. Unfortunately if you don’t set a memory burn, the next time you burn your candle it will burn out to the previous melt point and hit a wall of wax then tunnel down reducing the life of the candle. Wax left on the glass wall of a container is rarely incorrect wicking, it is simply that the flame does not have the strength to melt through that wall of residual wax, so it tunnels instead. So always burn your candle each time for as long as it takes for the wax to form a melt pool from edge to edge of the container and approximately 1 cm deep (but never burn it longer than 4 hours). Occasional rotation of a candle will also assist in an even burn. We want you to love every moment of your candle, however, it is essential to be aware of the safety precautions while burning candles. Most of these are common sense, but please ensure you follow these safety precautions whenever you burn your candle. Always keep burning candles out of the reach of children and pets. Never leave a candle unattended and extinguish all candles when leaving the room. Choose a safe place to burn your candle and keep away from drafts, curtains, papers and other flammable items. Ensure wicks are always upright and trimmed to 6 mm (1/4 inch) before lighting each time. Glass and tin containers may become hot, so always burn the candle on a level, fire resistant surface. Never burn a candle for less than 1 hour or for more than 4 hours at a time. 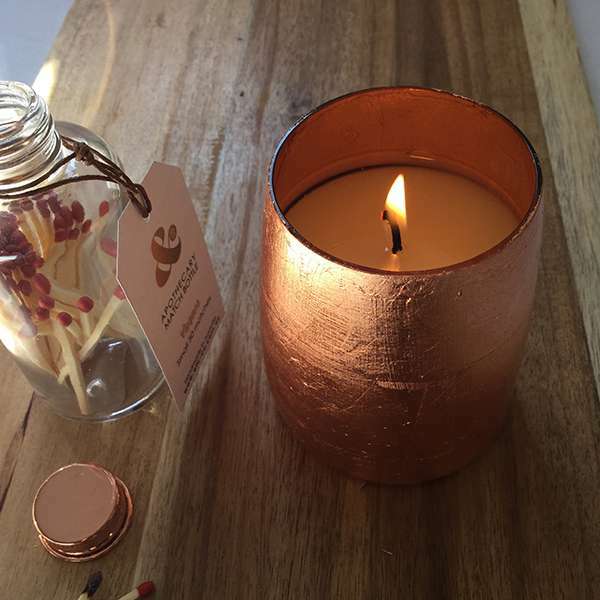 Do not blow out, or use water to extinguish your candle – the best method is to use a wick dipper (or a metal skewer) to gently push the burning wick into the melted wax pool then lift out. This also primes the wick with wax ready for the next burn. Stop burning your candle when 2cm of unmelted wax remains in the bottom of the glass. Do not use if the glass is cracked or chipped. When not in use keep covered with a lid or a glass dome to avoid dust build up. This also helps to hold the scent in. To prevent soot from forming on the glass, keep the wick upright and trimmed to 6mm before lighting. This will also stop a wick from mushrooming. If the glass container does become blackened with soot while burning, extinguish the candle, allow to cool and clean glass with a damp paper towel. Fun Tip: Burning candles in the bathroom whilst in the bath or shower will minimise your mirrors fogging up. Try it!